COPENHAGEN, Denmark -- NATO's chief on Thursday reported a sizeable Russian military buildup on the border with Ukraine that he said would enable pro-Moscow separatists to launch a new offensive with little warning. 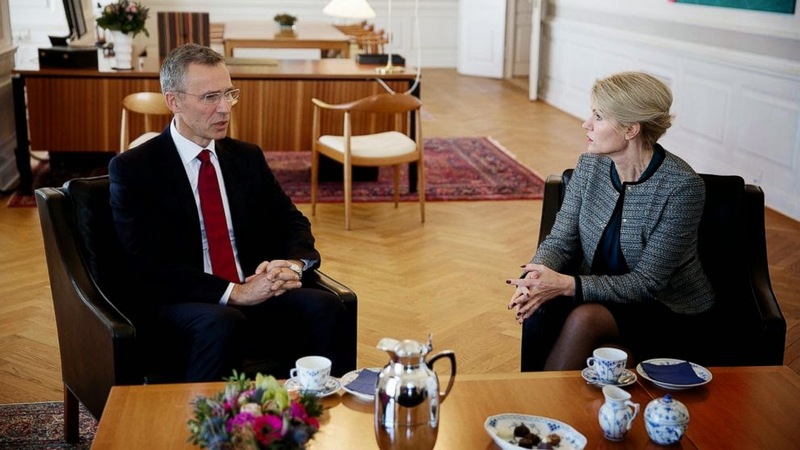 Secretary General of NATO, Jens Stoltenberg, meets with Denmark Prime Minister of Helle Thorning-Schmidt, right, at the Prime Minister's Office in Copenhagen on Monday April 20, 2015. NATO Secretary-General Jens Stoltenberg said Russia has substantially stepped up supplies to the rebels, as well as providing them with advanced training and equipment like drones, despite a cease-fire. Making an accusation of their own, Russian officials said U.S. military instructors were training Ukrainian national guardsmen in urban fighting techniques in the same eastern regions where Ukrainian forces and separatists have been fighting for the past year. In Washington, the U.S. State Department rejected the Russian claim of U.S. trainers in eastern Ukraine, saying all the activity was in western Ukraine near the border with Poland. "We've been doing this for about 20 years now," State Department spokeswoman Marie Harf told reporters, calling the Russian statement "ridiculous." Stoltenberg said the reported Russian moves undermine the cease-fire declared in eastern Ukraine and violate the Minsk agreements entered into by Moscow. He said more than 1,000 pieces of Russian military equipment have been moved over the past month, including tanks, artillery and air defense units. Stoltenberg said this "gives reason for great concern" and would enable the separatists to go on the offensive again with little warning. He said the U.S.-led defense alliance is not certain about the intentions of Moscow and the pro-Russian rebels, "but we are certain about the capabilities." The claim from Russian Defense Ministry spokesman Gen.-Maj. Igor Konashenkov that U.S. trainers are active in disputed areas of eastern Ukraine came one day after the U.S. State Department accused Russia of deploying air-defense systems in eastern Ukraine and combined Russia-separatist forces of maintaining artillery and rocket launchers in violation of the shaky cease-fire deal. Konashenkov denied those claims, and said U.S. military instructors are working in the vicinity of the cities of Mariupol, Artemivsk and Volnovakha. U.S. paratroopers last week arrived in western Ukraine to train national guard units.